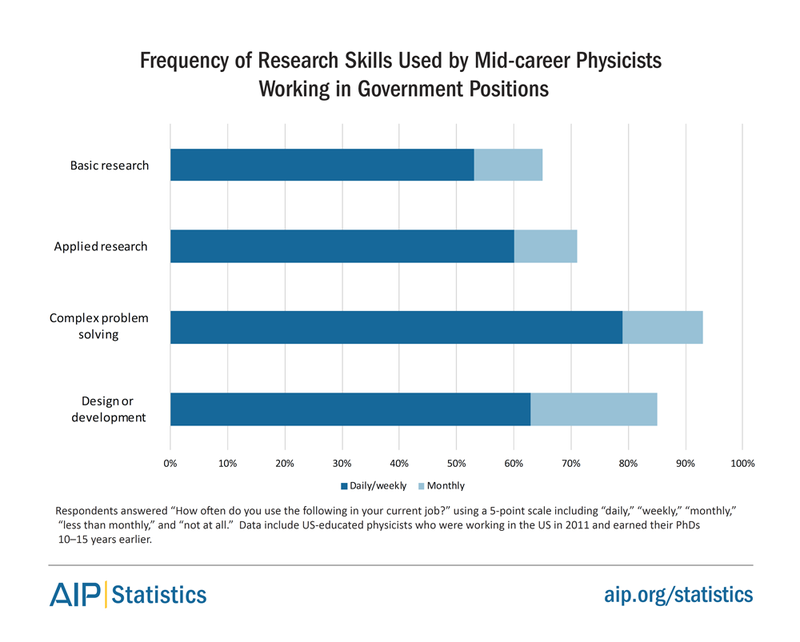 What duties and responsibilities do mid-career, PhD physicists perform in government positions? What do they find rewarding about their work? The PhD Plus 10 Study was our first follow-up survey of mid-career physics PhD recipients. In 2011, we contacted individuals who graduated with a physics PhD from the classes of 1996, 1997, 2000, and 2001 in the United States. Of those who responded to our survey, 225 were employed in the US government sector. This includes individuals employed at national labs, federal agencies, state or local governments, and in the military on active duty. In this report, we will describe the activities that government employees perform during their work, and what they find rewarding about their positions. 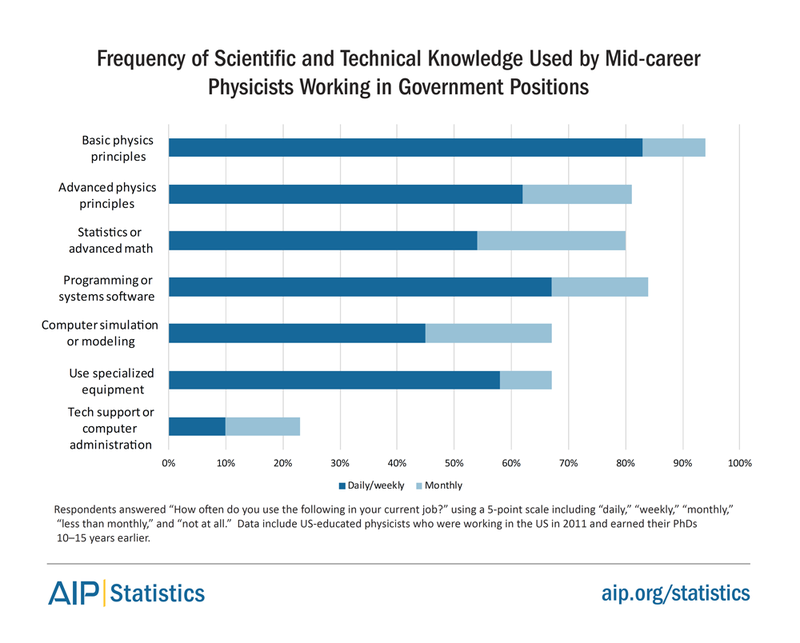 Of government respondents, 67% reported that they worked in physics or astronomy, and 30% reported that they worked in other STEM fields (Table 1). Respondents reported working in a wide range of physics and STEM fields, demonstrating the diverse possibilities of a physics PhD. Table 2 shows the common job titles for respondents in government, which includes research, engineering, technical, and management positions. There were also unique duties and responsibilities performed by government respondents, as compared to those not reported by respondents employed in academia or industry. Other respondent duties included running experiments, creating simulations and models, budgeting projects, examining and licensing patents, coordinating training courses, and conducting systems maintenance. In our survey, we asked government respondents “how often do you use or do the following things in your current job?” Respondents rated how often they used 24 different skills (daily, weekly, monthly, less than monthly, or not at all). 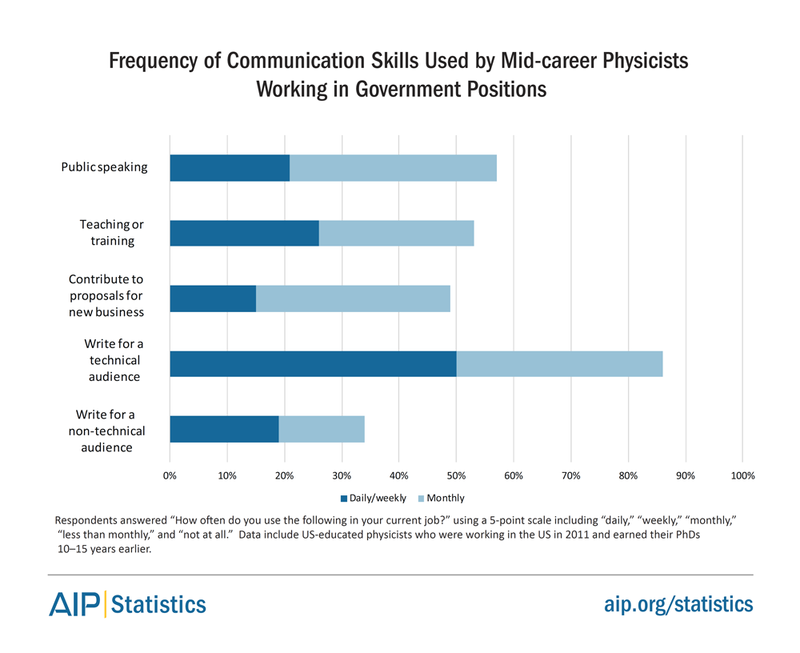 Overall, respondents used the following skills the most often: working on a team, using basic physics principles, performing complex problem solving, collaborating with physicists, and collaborating with individuals from diverse professions. The skills used the least often included: writing reports for non-technical audiences, working on proposals, working with customers, providing technical support, and performing teaching or training. Figures 1–5 depict respondents’ skill usage across five categories: research skills, interpersonal skills, technical skills, managerial skills, and communication skills. We asked government respondents: “what are the most rewarding aspects of your current job?” In the responses, we found four major themes describing these rewarding aspects: intellectual rewards, institutional rewards, social rewards, and societal rewards. Intellectual rewards. This theme describes mental skills and activities that respondents enjoyed in their current positions, particularly during research. Government respondents felt rewarded when they discovered new things, completed experiments or research projects, and found results. Many respondents also felt rewarded when they used their problem solving and critical thinking skills to address complex and challenging issues. Furthermore, respondents enjoyed solving diverse problems that required using a variety of skills. Institutional rewards. This theme includes any rewards that were related to an institution or organization’s available benefits and resources for their current positions. Most importantly, respondents felt rewarded when they had the autonomy and flexibility to pursue their intellectual interests and schedule their own work hours. They valued the resources available in their positions and felt rewarded when their job provided good benefits, salaries, and stability. Social rewards. This theme describes positive social interactions that respondents experience in their current positions. 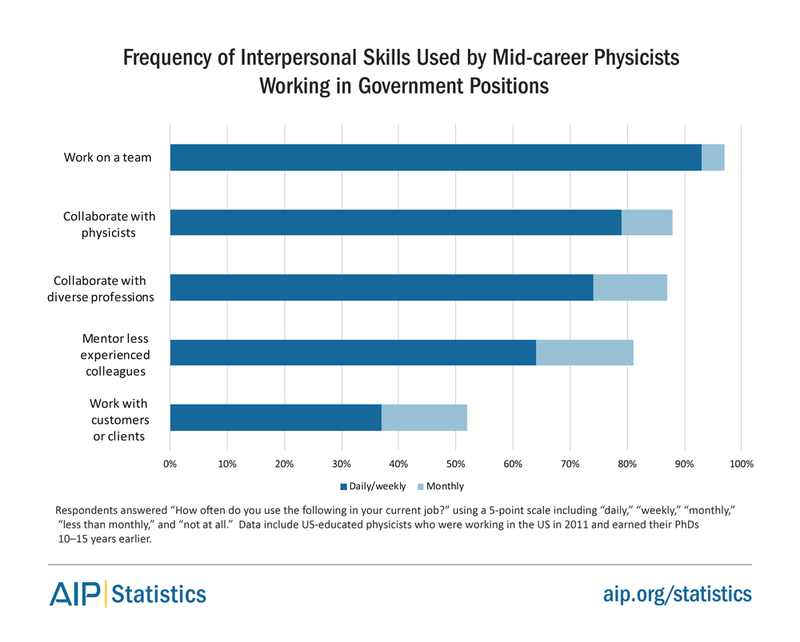 Government respondents felt rewarded when they collaborated with other team members and scientists who are interdisciplinary, diverse, and talented. Respondents also felt rewarded when mentoring younger students, postdocs, and researchers. Lastly, respondents enjoyed feeling connected and active in their research community. Societal rewards. This theme includes any motivations to help society and the larger scientific community. Government respondents felt rewarded when the results of their work were applied outside of their lab and organization, and when they gave back to the general public and their scientific field. Specifically, respondents described how their work benefited the military, national security, public health, and the environment. 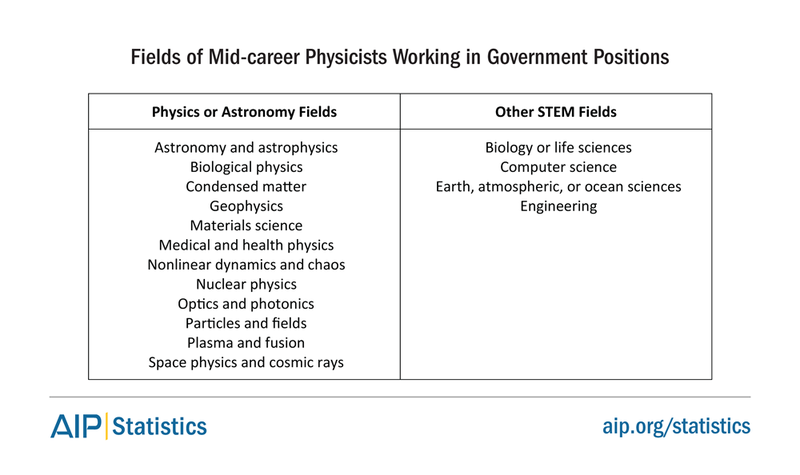 The results of this report demonstrate that mid-career physics PhD graduates employed in government are working in diverse physics and STEM fields and in a wide variety of positions. Within these government jobs, most employees performed duties related to research, development, and project management. Individuals working in government reported experiencing many intellectual, work environment, social, and societal rewards in their career. The most frequently reported rewards included: collaborating with team members, solving complex and difficult problems, mentoring others, learning new things, and having a positive impact on society. During 2011, we contacted over 3,400 physics PhD recipients from the classes of 1996, 1997, 2000, and 2001, and who graduated from US institutions. We received responses from 1,544 individuals that were currently working in the US. We know that the respondents are not representative. It was easier to find members of the more recent classes than the earlier classes, and based on an analysis of the respondents by contact wave, we believe that it was harder to contact individuals employed in industry than those in academia or the government. The Statistical Research Center also conducts surveys with recent physics degree recipients one year after graduation. 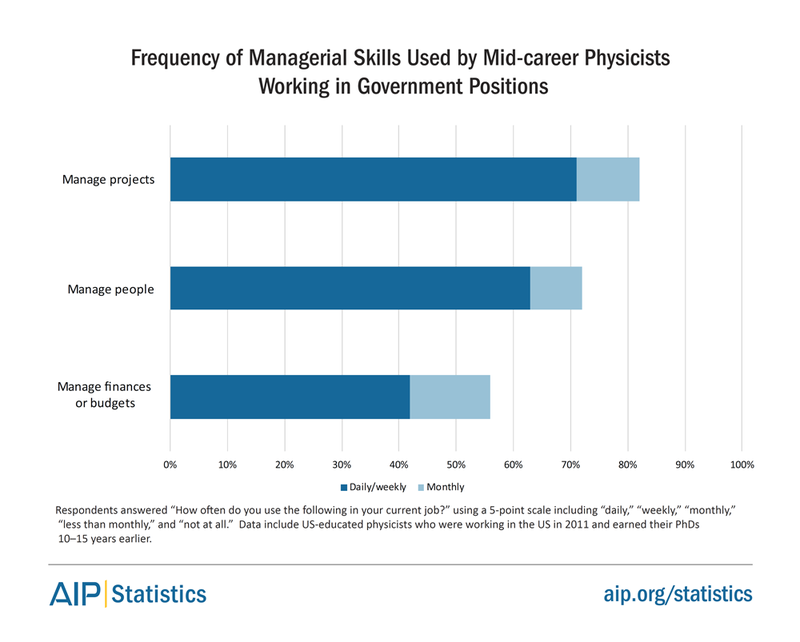 The reports from these survey studies include data on starting salaries, employment sectors, employment fields, and skills used by employed physics degree recipients. The reports can be found at the following link: https://www.aip.org/statistics/employment.